Who’s Coming Up on Monday, January 25? EKK 2016 Here at last! The ambiance was electric as the EKK ‘ohana gathered for the opening night of EKK 2016. 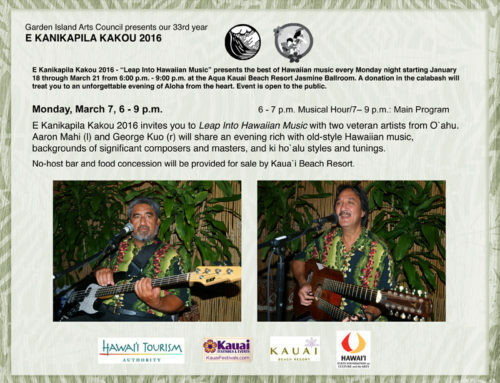 Residents, snowbirds, new faces from all over the continent, Canada, New Zealand and Japan gathered to “Leap Into Hawaiian Music” after a whole year’s absence from Kauai’s unique EKK program. Lots of honi honi as everyone greeted their old friends, excited wala’au as everyone was catching up on news about each other. A record crowd was present for opening night as three of Kauai’s veteran musicians pooled their 100-plus years of musical entertainment experience to set the tone for the 33rd season of EKK – Paul Togioka, Kenny Rapozo and Ernest Palmeira – brought their A-game to the stage for a great first night. Paul Togioka, well known for his participation in the Hawaiian Slack Key Guitar Festivals, opened the program with three slack-key medleys as he shared stories about the artists who influenced his own musical journey and a bit of background on how the slack key style of guitar playing got started and developed in Hawai’i. His first medley demonstrated the different popular styles of slack key; his second medley was a combination of very old style slack key. You could hear the influence of Keola Beamer, Raymond Kane, Ledward Kaapana and other slack key greats in his music. His final medley, which included two of his own compositions, included Hula Medley, Pupule Slack Key and Moloka’i Mule Ride. He shared his own risky venture on the back of a mule switch-backing precariously down the steep mule trail to Kalaupapa on Moloka’i. 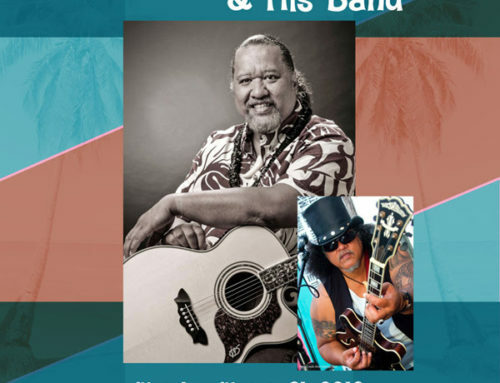 Recipient of the Hawaii Music Awards “Best Recording by a Slack Key Artist”, Paul has performed at the Grammy Museum and the Wolf Trap National Park. His CD Aikane Kuikawa was nominated for the Na Hoku Awards in 2014. Paul continues to hone his craft as a slack key guitar artist when he is not at his day job as engineer with the County of Kaua’i. Kenny Rapozo, who led the ‘ukulele circle during the first hour and made “picking” on the ‘ukulele easy as duck soup, shared 13 songs – 10 on the ‘ukulele and three on the guitar. Picture this: He steps on the stage looking like a swarthy gun-slinging paniolo about to draw his pistols. When he said, “I’m going to play two ‘ukulele and one guitar but not all at the same time,” we knew we were in for a treat. He strapped on his ‘ukulele and launched into his favorite Disney song, It’s A Small World, that sums up his love for Disneyland, a destination he has visited no less than 19 times. Another slow Disney song was When You Wish Upon a Star. Of course, everyone could relate to the familiar famous tunes of Disneyland so you could see feet tapping, heads bobbing along with the music. He shared his version of the story of how the Portuguese instrument brought from Portugal got its name ‘ukulele. A German man was picking on the instrument with flying fingers when a Hawaiian man from the audience yelled out ‘ukulele translating to “jumping flea” in Hawaiian. The Arthur Godfrey name for the instrument was “yukulele” which is not correct. No self-respecting “uku” (flea) wants to be called a “yuku”. His repertoire covered a wide range of musical styles as he played Whispering, popular in the 1940s, in the style of Chet Atkins playing with his thumb on the top string and fingers on the bottom strings, Buddy Holly’s Every day with Richie Valen’s LaBamba from the 1940s and 1950s, Listen to the Falling Rain, and the popular William Tell Overture from his favorite Lone Ranger radio show in the 1950s. His mastery of the little instrument was topped off when his flying fingers brought images of Spanish dancing ladies twirling in their ruffled skirts in his exciting rendition of Malaguena. Oldies sounded great on the ‘ukulele. He threw in a couple of Hawaiian songs with apologies that he did not know their titles as he picked them up by listening to someone else playing them. His Dad was an ‘ukulele instructor on Kaua’i so Kenny happily sat in the back of the class and picked up his ‘ukulele skills as a young boy. Kenny switched to the guitar and played one of his favorites, a popular 1970s tune called Mr. Bo Jangles, Take Me Back to Sorrento by Elvis Presley in flamenco style and Ghost Riders in the Sky, Portuguese style. When asked to show the audience how good the Kamoa ‘ukulele sounded, he played a lively Zippity Doo Da Zippity Day. “As you can see, I miss Disneyland, but I’m going again next January.” Winner of the Kamoa ‘ukulele was Richard Stefenco from Kapa’a. Paul Togioka came back on stage wielding his banjo which was his first love in music when he was 20 years old. It’s an instrument that he confessed he had been neglecting of late. In fact, he said that playing on the banjo was even scarier than his recent experience of skydiving as he jumped out of the airplane two miles up in the sky and fell at 120 miles per hour until his parachute finally opened up. A special surprise was a duo as Kenny joined Paul Togioka and his banjo. They did well together playing a Shuffle Song written by Kenny. It was so catchy that some folks in the audience were caught up in their own hoe-down dances. Kauai’s own steel guitar master Ernest Palmeira joined Kenny on ‘ukulele and Paul on guitar and together the trio played eight well known songs with that haunting, nostalgic sound so reminiscent of the early days of Hawai’i Calls, suggesting romance in the tropics. Moonlight Baby, Blue Hawaiian Moonlight, He Aloha No Honolulu, Blue Hawai’i, Hula Lady and Sands, favorites of the steel guitar players, swept over the audience with the rich full sounds of old and contemporary Hawai’i all rolled into one. In the 1940s and 1950s folks traveled to Hawai’i on giant cruise ships so when they docked at port, the music that greeted them was the sound of the steel. Even today when visitors get off the airplane and hear the steel guitar they know they have landed in Hawai’i. For a period of time, the steel guitar seemed to be waning in popularity as an instrument of choice, but recently there has been a huge resurgence of interest and development of new directions with the steel guitar. Through it all, Ernie was never far from his favorite instrument. Ernie, who has been playing the steel guitar since age16, confessed that he was self-taught because there was no one on the island to teach this young paniolo to play this exotic instrument. Tending his cattle every day, he had no time to go to Honolulu to learn so he taught himself. He certainly has become a master at it with years of playing at the Coco Palms Resort, at the Fern Grotto, at the former Hilton, which is now Kaua’i Beach Resort, and at many other venues. He even toured with the airline promotions to Caracas, Venezuela. It was a great way to introduce EKK to the huge group of EKK “newbies” who will certainly come back once again to experience Hawaiian Music like they were at an informal backyard jam. Where this week’s program featured three instrumental musicians, next week’s artists will have their voices as their primary instruments so be prepared for a lot of wonderful singing.